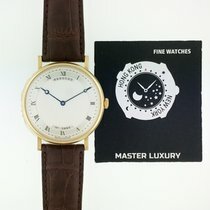 This is an 18K gold Breguet Classic Classique Ultra Thin, 5157BA/11/9V6. It has a leather strap with a matching 18k yellow gold tang buckle, a scratch resistant sapphire crystal, and a push/pull crown. The 38.4mm diameter solid three-body case, rounded bezel, straight down turned lugs, coin-edged band, and snap-on transparent display sapphire case back are polished. The dial has hand engraved (engine-turned) silver guilloche, black painted Roman numeral hour markers on a plain reserve, blued "Breguet" style hands, and an outer dot minute track outside the dial rim. It's water resistant to 30 meters/100 feet, and there is a 45-hour power reserve at full wind. The 5.8mm case, dial, and movement are all signed. The automatic self-winding Breguet caliber 502.3 movement is rhodium plated, with fausses cotes embellishment. It's constructed with 35 jewels, a shock absorber mechanism, and a straight-line lever escapement. 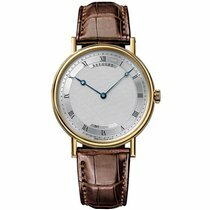 It includes a monometallic balance that's adjusted to five positions, a self-compensating Breguet balance spring, and a gold rotor.